A Pumpkin, A Turkey, and an Old Man walk into a Gnome Bar. For Jack, Tom and Nick… the rest is history. To me, the funniest part of the Sugar Sleigh Ride 2.0 is Santa’s rather generous tummy. It looks like Ohm Gnome has kicked Santa out of the sleigh and he’s hanging on, but his pants are slipping off. Check out the details below. I had a hard time getting a good photo of the turkey in the backseat, so made a video instead. Here you can see how Santa is articulating. He actually slides along the rails. He’s not sliding in this video, but trust me, he does slide. 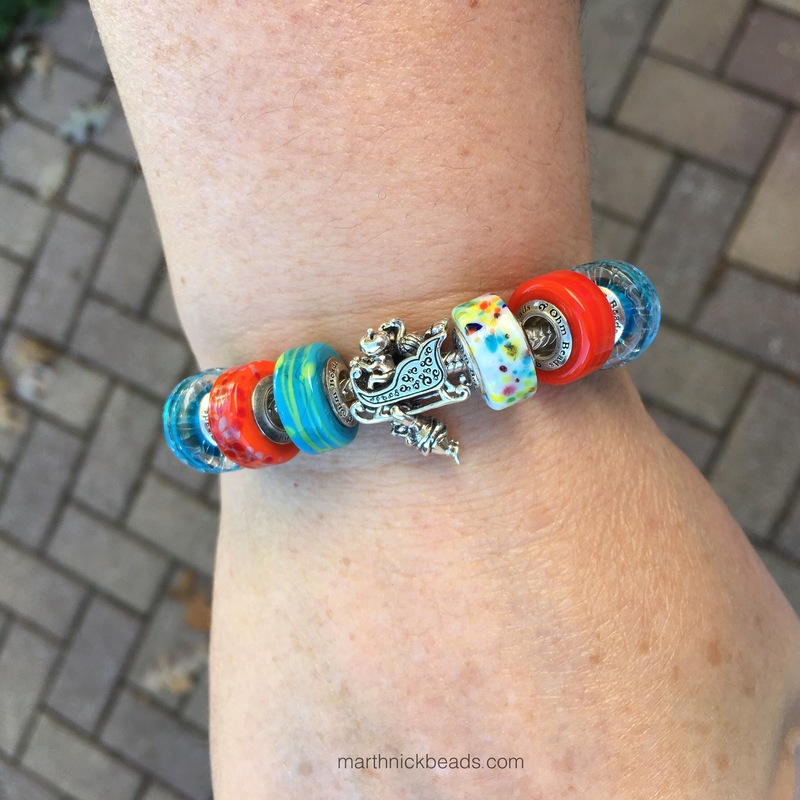 There are a few ways to wear this bead and this first way might be how I use it the most…on a necklace! The kids in the schools where I teach are going to LOVE this! I also like it by itself on a bangle. It’s a substantial size and makes a good statement on its own. Or, with some colourful Ohm Beads might be a way to go. Below left to right are Blue Hole, Ganges, Confetti Upchuck, Thames, In the Koi Pond and another Blue Hole. It’s way too early for Christmas bracelets but I couldn’t resist trying trying one out with some True Beadz. Left to right below are True Touch Gooseberry, True Touch Strawberry, True Blossom Siberia, True Taste Siberia, Almost Quartz and True Touch Gooseberry. Lastly, I bought some little chocolate treats in Stratford, ON when I went to see Macbeth this week and thought they would go well with the Sugar Sleigh Ride 2.0. 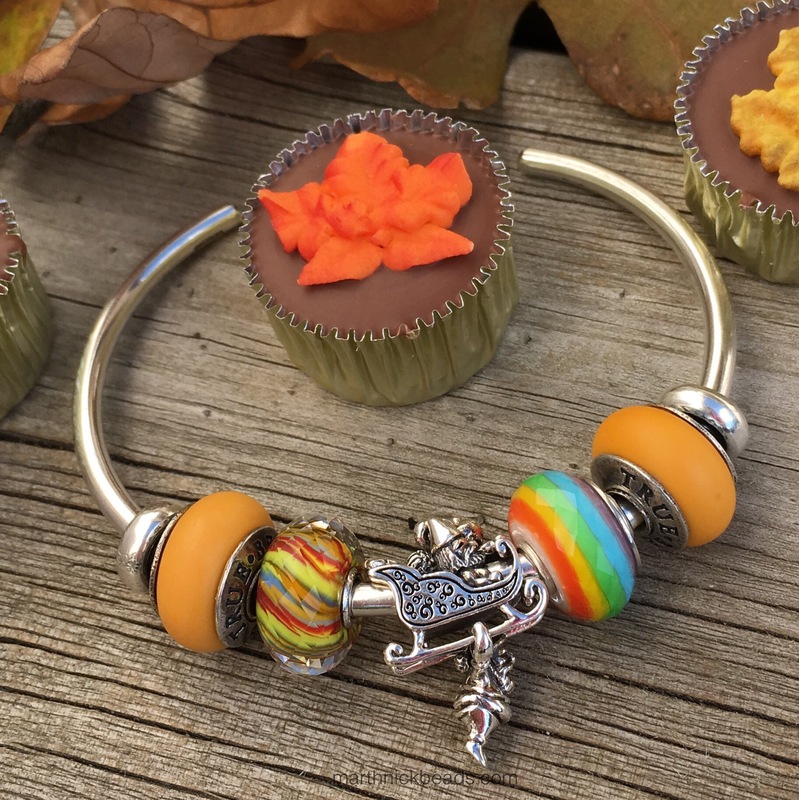 This bangle has two True Touch Pumpkin True Beadz plus the River of Life and Celebrate Life from Trollbeads. This is quite a cheeky bead, with lots of detail and a fun story to it. Perfect for the holiday season, which starts tomorrow in Canada with our Thanksgiving. Almost all our family birthdays take place between now and Christmas, so with Hallowe’en coming up also, this bead is aptly named. I don’t usually do blog posts on the weekend, but have a lot of really cool seasonal beads to show before the next big collection comes out. So Monday will be some Ohm Beads spacers, Tuesday will be the Ohm Beads Jiangshi, Wednesday will be the Redbalifrog Book of Spells and Friday will be the Ohm Beads Dark Shadows (3E) glass beads. Happy Thanksgiving to my fellow Canucks! This is my most favourite bead of the year! The detail is amazing and funny! And I love your different bracelets! Thanks Trudy. I love the detail and the story, so funny! Quelle est l’histoire de ces personnages ? En France nous ne connaissons que le père Noël. J’adore les détails que je n’avais pas vu sur les photos des boutiques, merci ! De rien, Sylvie. Le dindon est parce que nous mangeons de dinde pour le Thanksgiving. Le potiron est pour le Hallowe’en. Ohm Gnome est de main de jardin est fait de mal. Je pense que ce qu’il pour le commencement de la saison de fête. Sorry about my bad French! I have to say I like it best alone on the bangle. It might be early , but that Christmas bracelet sure is pretty. It’s great to see the different bracelet ideas because I can’t always picture how to wear something. Suzanne, I think it’s nice on a bangle alone too. When you consider the price, it would be nice to really enjoy it by itself. I love the Christmas bracelet too and am glad you enjoyed the different ideas! 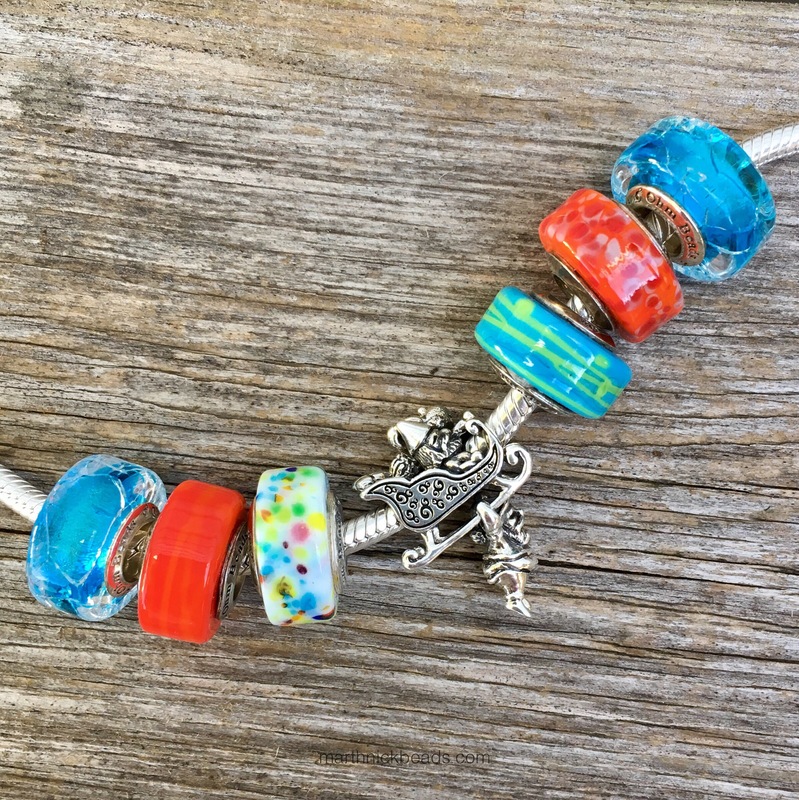 This is such a fun bead! I was lucky enough to just recently get one of the original version, so I had to have this one to go with it. I absolutely adore Ohm’s sense of fun, and am becoming a bigger and bigger fan of the brand as time goes on. Happy Thanksgiving to you! Thanks Kim! Just one more bathroom to clean then I can get the table set. 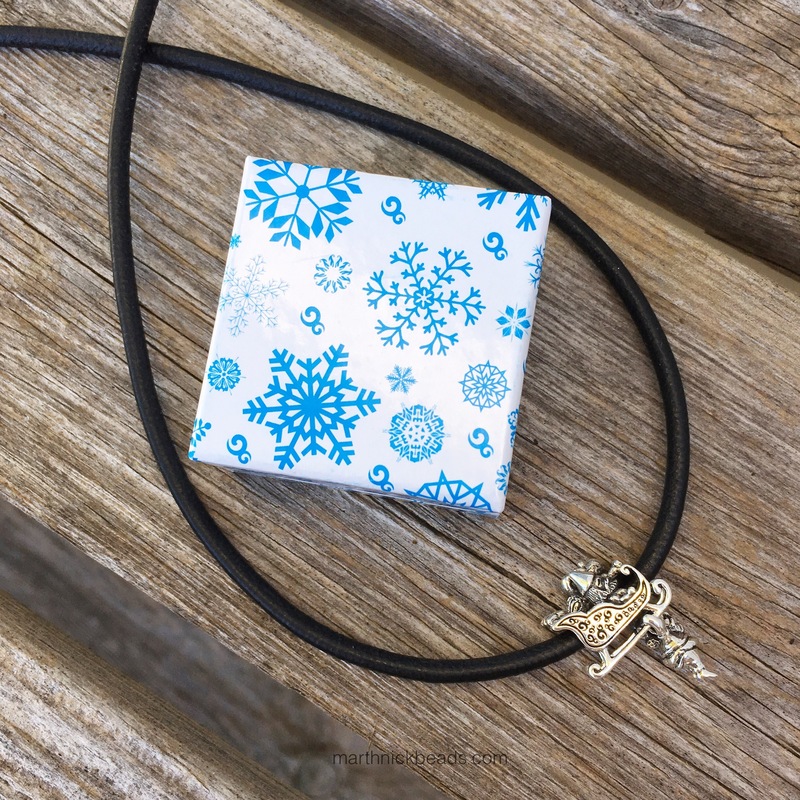 I loved your photo of the bangle with both sleighs on it. Such fun! 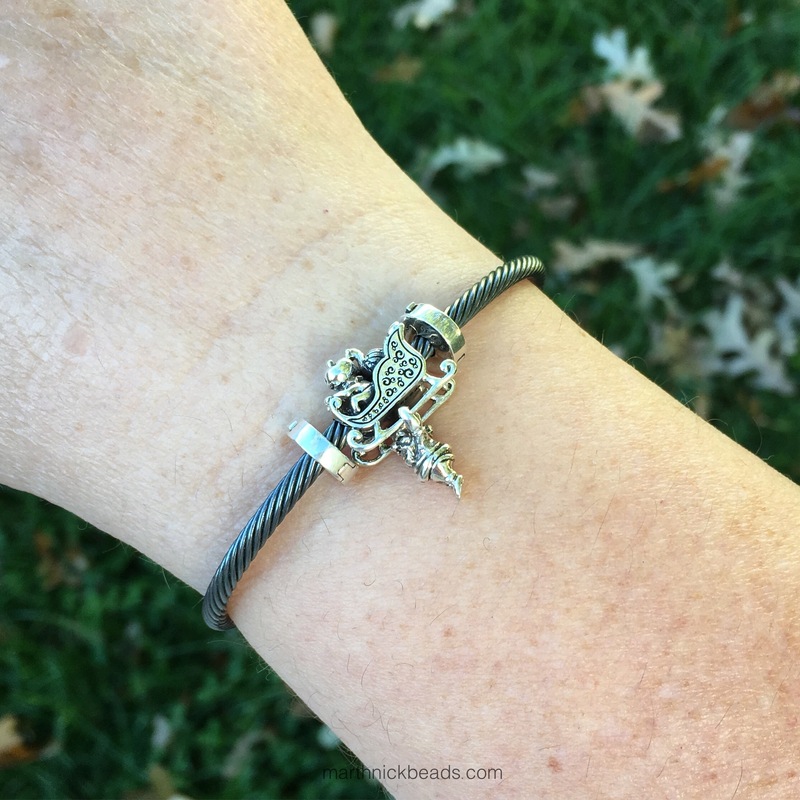 Tracy, take a look on IG to see Kim’s picture of a bangle with both beads if you haven’t already…it looks awesome. But it’s such a nice size for a necklace, too, so I bet you’ll end up using it both ways. Because I’m usually teaching music, when classes line up (usually 6 classes a day) whichever kid is in the front inevitably comments on my necklace. It will be fun to see how many notice the pants are falling down on Santa, tee hee hee! I love the spirit of this funny but beautifully designed bead. I don’t buy many Christmas beads, but this might be the one for this year. It totally “charming”. The detail really is lovely. 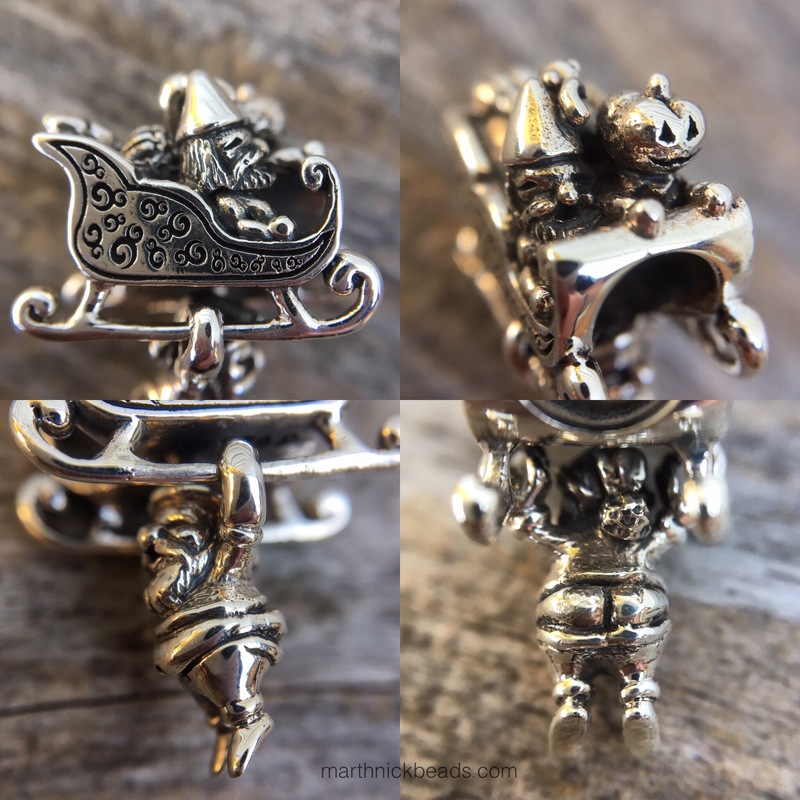 I like the Ohm logos all over the sleigh. I must confess that I usually buy just one Christmas bead a year! Thanks Carol! Yes, so cool how he slides along! 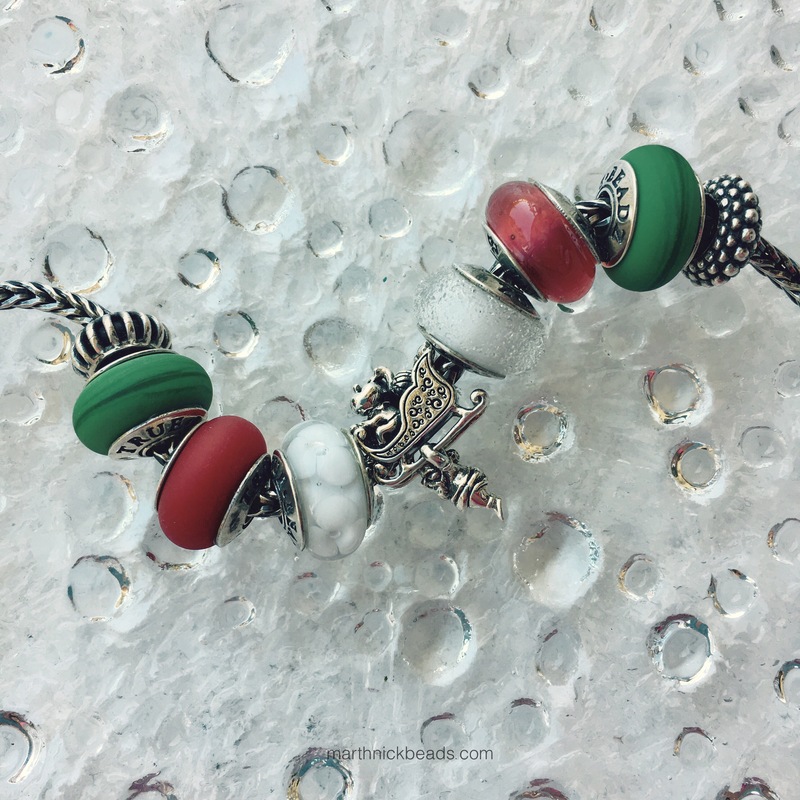 Love the detail on this bead!